Commodities stood mostly firm today. This being a boost in sentiment due to Friday’s disappointing jobs data. Traders were betting that US interest rates will be held lower for longer thus increasing demand for commodities, especially in emerging economies which are likely to feel the most pain from any rate rises. A consequence also being that dollar strength will be kept in check for the time being. Brent crude was trading strongly at $52 per barrel. This brings the rally since last week to nearly five dollars (10 percent). The rally lost some of its momentum on Wednesday after the weekly report from the Energy Information Administration showed an unexpectedly large increase in US crude supplies. Supplies increased by over three million barrels on the week before. The median forecast was for a rise of 2.2 million barrels on the previous week. The Australian dollar was also in upbeat mood. Yesterday’s meeting of the Reserve Bank kept interest rates on hold at 2 percent (as widely expected) for the sixth month. 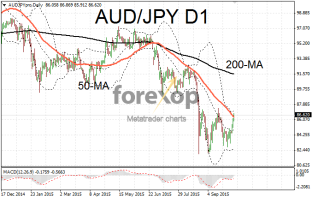 The weakness in US fundamentals gave traders an excuse to buy the beaten down Aussie again. Furthermore the RBA was not overtly dovish in its statement which was taken as a positive. AUD/USD has seen a precipitous fall from 0.95 12-months ago so traders were wary of trying to call the bottom on this brutal bear market. 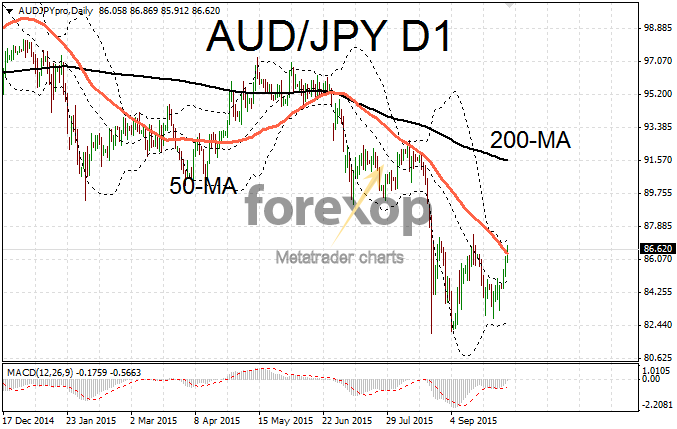 AUD/JPY rallied strongly taking the pair back up to 86.62. The pair is meeting resistance around the 50-day moving average. This comes after completing a classic double bottom pattern. The New Zealand dollar was lifted in similar fashion. NZD/JPY and NZD/USD both extended modest gains on Wednesday as sentiment towards the kiwi saw a boost. NZD/JPY lifted back up to 79.49. NZD/USD, one of the most rebuked pairs in recent months, saw a lift up to 0.6655. USD/CAD displayed a classic hammer pattern following a deep descent to 1.2970. This comes after one week of steep falls but this left many traders wondering if the rally in CAD has already run its course. The steep correction took the pair down from 1.3456 last week. The loonie has seen some resurgence on a more optimistic commodities sector. Canadian unemployment rates are due out on Friday as well as a business survey from the country’s central bank. Both of which will be closely watched.